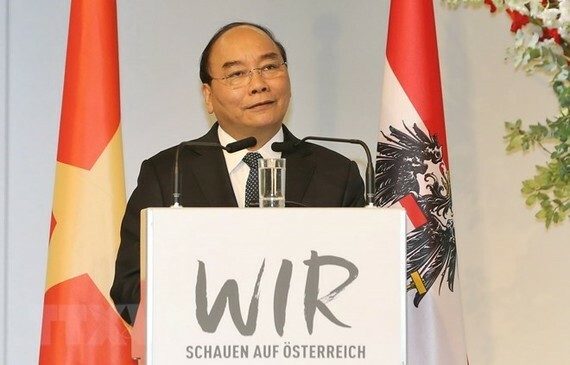 Prime Minister Nguyen Xuan Phuc called on Austrian businesses to invest in a wide range of areas in Vietnam while addressing the Vietnam-Austria Business Forum in Vienna on October 15. PM Phuc, who is paying an official visit to Austria, suggested Austrian enterprises invest in high-tech agriculture, processing and manufacturing industry, especially agricultural product processing, high-tech zones, infrastructure development and tourism. 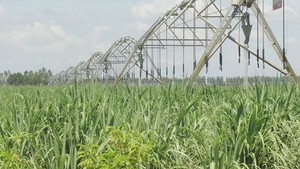 Vietnam will also create optimal conditions for Austrian investors to buy stakes of State-owned enterprises, he promised. PM Phuc briefed participants, including representatives from 60 Vietnamese businesses and over 100 Austrian companies, on Vietnam’s economy which has grown continuously and is expected to expand by about 7 percent this year. “Vietnam will strive to maintain the growth pace to create favourable conditions for investors in the country,” he said. Vietnam is a large market with a population of almost 100 million, and 65 percent of the country’s workforce is young and the middle class is on the rise, the leader said, adding that the increasing number of internet and smart phone users in Vietnam has also opened up great opportunities for e-commerce development. The PM stressed that Vietnam has signed and planned to ink 16 new-generation free trade agreements (FTAs), including the future FTA with the EU in the time ahead. “Vietnam is committed to making continuous reforms and facilitating foreign investment in the country,” he pledged. He pointed out that although trade turnover between Vietnam and Austria is projected to hit about 4.5 billion USD this year, the flows of investment capital in each other’s market remained modest, standing at only around 200 million USD. Given this, PM Phuc urged Vietnamese and Austrian enterprises to step up investment and cooperation, for mutual benefits, economic development in each country and stronger bilateral relationship. Addressing the forum, Harald Mahrer, President of the Austrian Federal Economic Chamber, said Austrian firms have clearly recognised Vietnam’s development over the past years, which, he said, would open up great opportunities for investors. Vietnam is one of the countries enjoying the fastest development in Asia and the world with a trained young workforce and an increasing number of newly-established enterprises and startups, especially in IT and digital technology, he said. Mahrer affirmed that Austrian businesses are interested in the Vietnamese market which will have a population of nearly 100 million and its gross domestic product (GDP) growth is forecast to double in the years to come. Highlighting Vietnam as a big market for Austrian exports, the official said that the Austrian Federal Economic Chamber has decided to open its representative office in the country. At the forum, PM Phuc and representatives of agencies and businesses of the two countries witnessed the signing of cooperation agreements in such areas as energy, credit, manufacturing industry and health equipment. A cooperation agreement between the Vietnam Chamber of Commerce and Industry and the Austrian Federal Economic Chamber will also be signed on this occasion, under which the two sides will cooperate in supporting businesses of Vietnam and Austria as well as the implementation of the EU-Vietnam FTA. Also on October 15, PM Phuc met with Ernst Wastler, Chairman of the Board of Vamed Group and Tao Ngoc Tu, Chairman of Tan Viet Group, and held a talk with representatives of leading Austrian businesses. Austria is the first stop of the PM’s trip to Europe, during which he will also pay official visits to Belgium and Denmark, make a working visit to the European Union and attend the 12th ASEM Summit (ASEM 12) and the Partnering for Green Growth and the Global Goals 2030 Summit (P4G).